Australia is in the midst of unprecedented economic circumstances. The combined efforts of Government, business, peak bodies and employees are required to face the challenges ahead. 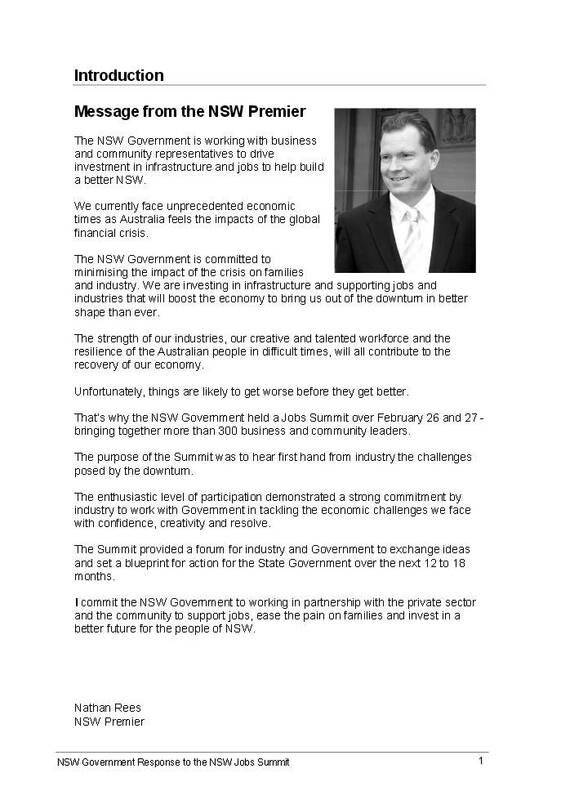 In response to deteriorating global economic conditions, the NSW Jobs Summit was held over the 26th and 27th February 2009. Over 250 key business and community leaders, major employers and education and training experts came together to consider actions that Government and industry can to take to support jobs. Day one focused on actions to promote business growth and protect jobs in twelve industry sectors, bringing together a range of stakeholders including Chief Executive Officers from the biggest employers in NSW. 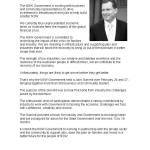 Posted in Asia Pacific, Economy, Federal, Governance, Local Industry, Primary Industry and tagged Australia, Australian Government, business growth, Chief Executive Officers, economic circumstances, global economic conditions, industry sectors, NSW, NSW Government, NSW jobs Summit, NSW premier, stakeholders.